Tech Readers » Mobilink Jazz to Celebrate 28th September as Cash Prize Day! 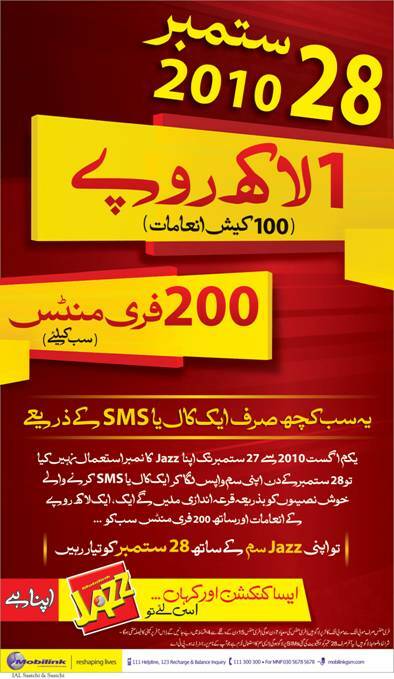 April 23, 2019 7:02 pm You are here:Home Telecom Cellular Mobilink Mobilink Jazz to Celebrate 28th September as Cash Prize Day! Mobilink Jazz to Celebrate 28th September as Cash Prize Day! Continuing with the tradition of rewarding its customers for their patronage, Mobilink brings fabulous Cash Prizes on 28th of September, 2010. All Mobilink Jazz customers who have not used their SIMs between 1st August and 27th September will become Guaranteed Winners, by simply using their Jazz SIM on 28th September 2010, to make a call or send an SMS. 200 FREE minutes (On-net) will be given to all customers who re-activate their SIMS on 28th September. No subscription is required to avail this offer. All these winners will also enter a Lucky-Draw for a chance to be among 100 WINNERS of cash prizes worth Rs. 100,000 each!! !